Finds from this past weekend & from the last couple weeks. All fabulous! A visited Southworks this weekend in Cambridge, Ontario this past weekend. It's an antique mall with just over 30,000 square feet, quite large, but not larger than the One of a Kind Antique Mall in Woodstock. Although Southworks has a lot of Pyrex, the price is not right for me & given time I'll find the pieces I desire at the thrifts. Give me convenience or give me death, right? 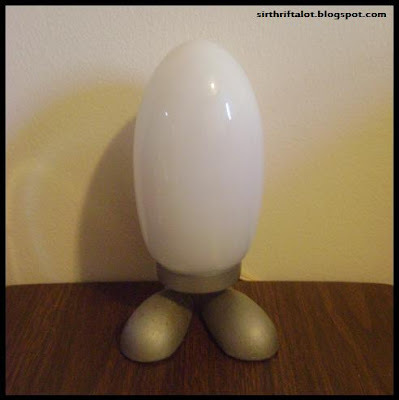 There were two delphite refrigerator dishes, but I had a stern voice tell me to pass, especially since I was spending $18 on this lamp below. Back onto Southworks. Of the two other antique malls I have been to, this has been my list favourite. They had some wonderful stuff, but it has been more expensive & the shopping experience was less personal. Way too much stuff behind glass, quite expensive compared to the others I have been too & the staff were walking around watching you waaay too often. Two sets of salt & pepper shakers I picked up at Southworks. 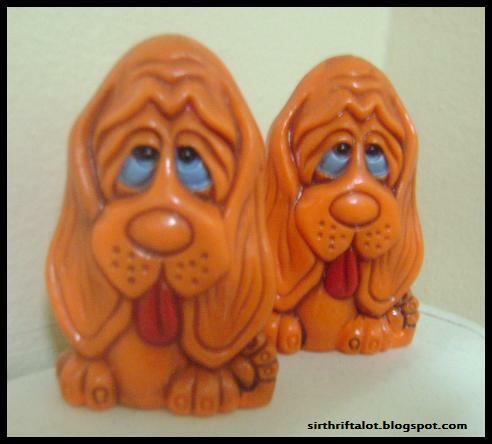 The dogs are so depressing & that's why I love them. The deer are quite fancy, beautiful even. Looking at them makes me smile - one extreme to another I supposed. 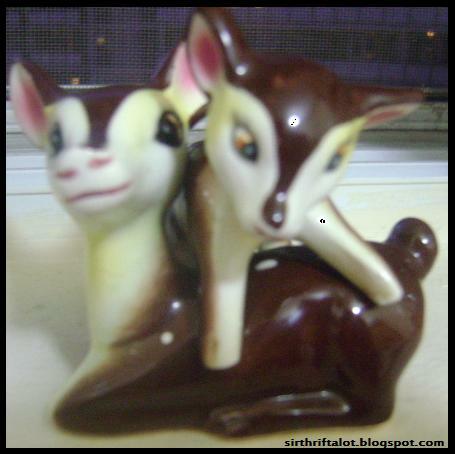 I'm quite fond of the deer, such fantastic condition. They need a better photo. They are going in my glass case. Did I tell you? I got a glass case? No? I'll have to tell you about it later. I visited a Value Village this weekend, which my bestie & her mother brought me too, a recently opened one, they look so neat when they open, so organized. 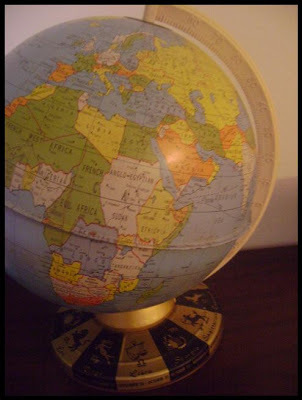 I happened upon another metal globe - priced to move at $5.99. The zodiac globe! Unfortunately, I either didn't notice or broke it on the way home - there is a dent in North America & it fell off it's axis (is that what you call it?). Still great decor! 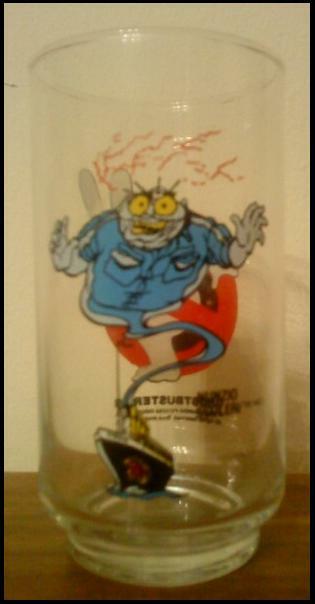 A find from One of a Kind. It cost me $12.50, but I've seen uglier scales go for upwards of $8 at the thrifts & I want sorta a turquoise kitchen. This will do wonders if I ever decide to diet! And what do you think of my new sewing machine salt & pepper shakers? Cheap too! Another Cambridge find! 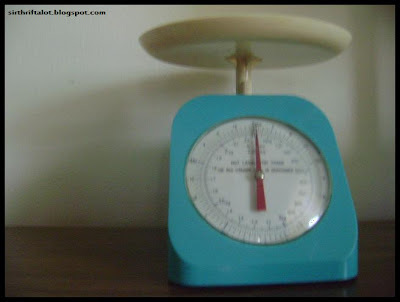 Joining everybody over at APRON THRIFT GIRL for THRIFT SHARE MONDAY. Also at FLEA MARKET FINDS with HER LIBRARY ADVENTURES. Butterprint is such an amazing story. My boyfriend took a trip with his mother to Ohio to visit his grandfather last week & he sends me a photo of a pink Butterprint casserole - such a tease! It's grandpa's & he won't part with it for anything. I'm told he's got Pyrex all over the house. I asked for no more pictures. I made him visit the only thrift store in town to check out the Pyrex & salt & pepper shakers - the store was a dud. I'm told the town is pretty much a dud. & this is a Windsor buy I almost forgot about from Bibles for Missions! A whole $1! Is this Old Orchard? I'm not sure. #471. Very, very good condition! Would have been great if they had the whole set. 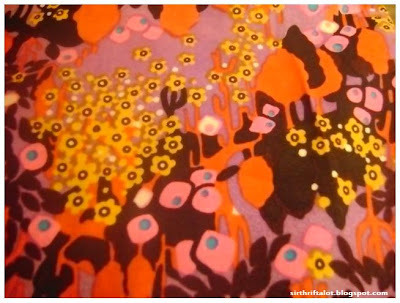 Check out this retro polyester fabric from Talize! I'm making myself a pair of pants right after I post this (not really). $1.99. Wouldn't have spotted it without the eyes of my bestie. Now these are internet buys, too good to pass up. Who knew Delta Impex Watch Corporation made a Married With Children Watch back in 1987? 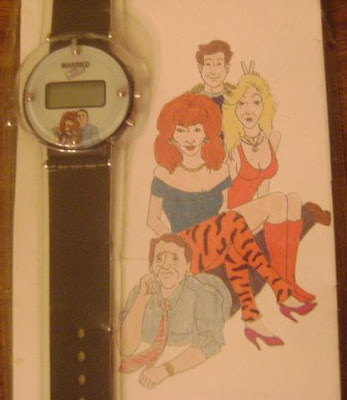 I've still got my eyes on a calculator watch, fingers, eyes & toes crossed to find one at the thrift shop! 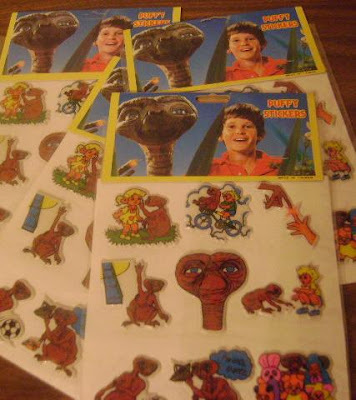 Some retro E.T. puffy stickers. 4 packs. Same price I usually pay when I shop at Funky Junky, $3 a pack, so it wasn't too bad. My cousin is going to get a fantastic addition to her wedding present this year! 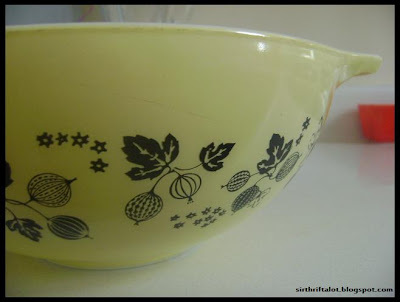 Thrifty Things Friday: Pyrex Haul! 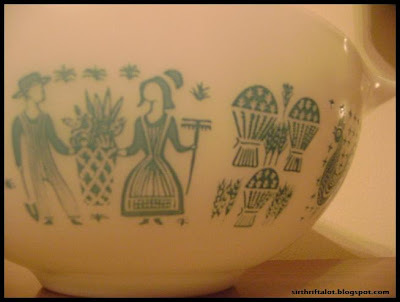 If you are a regular reader, you may know about 2 weeks ago I made a long trip to Windsor, Ontario stopping at maybe 15 thrift stores along the way, including a massive antique warehouse in Woodstock, Ontario. I haven't blogged much since then, have been exhausted ever since!! 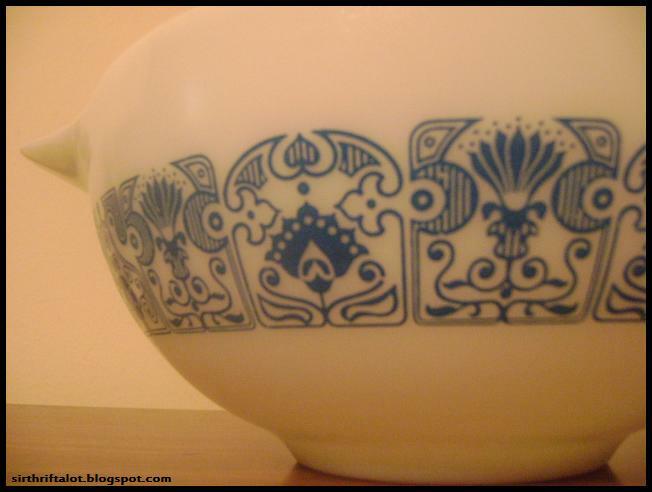 !, but here is my Pyrex from that trip! 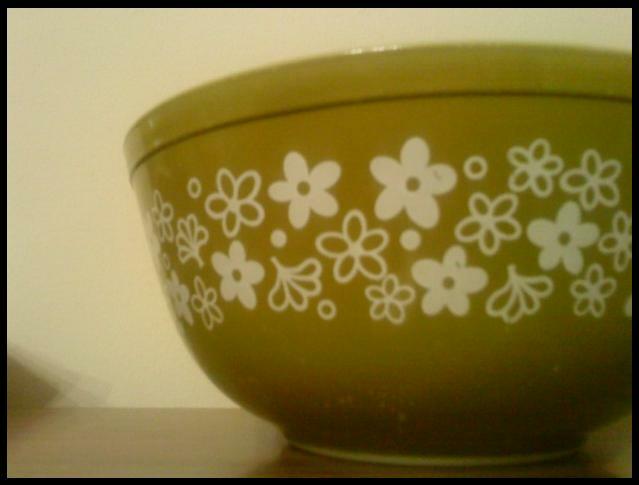 My first pick up was this #403 Spring Blossom Green bowl in Burlington in OK condition. 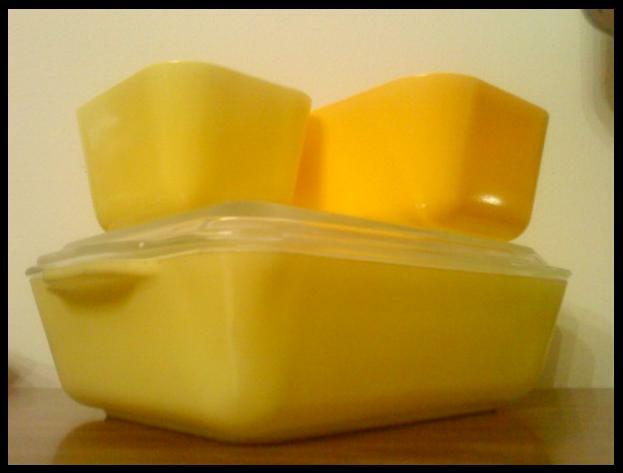 I got a wonderful, wonderful birthday present from my friend Agnes - #503 yellow refrigerator dish. It completes my primary refrigerator dish set, minus the lids for the red ones... unless we're borrowing from some of the others I own. This piece is shown in the picture with a yellow #501 & a yellow #502, but priced reasonable, in great condition, sans lids & both found in the same both at the Woodstock antique warehouse. Now we move onto the Pyrex found in Windsor. 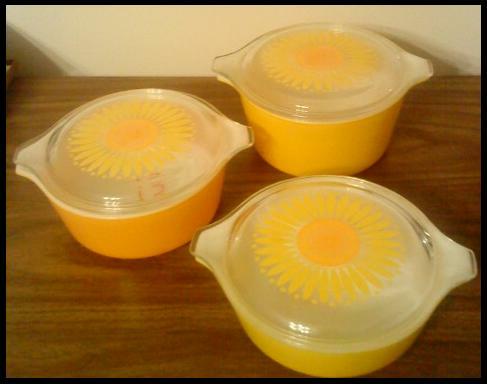 #473, #472, #471 of the beautiful Daisy Cinderella Bake Serve Store Casseroles. They were $4.99 each, in good condition, lids look a tad bit dish washed, but I love the set. Seemed a little like a pattern on this trip - either flowers or yellow! 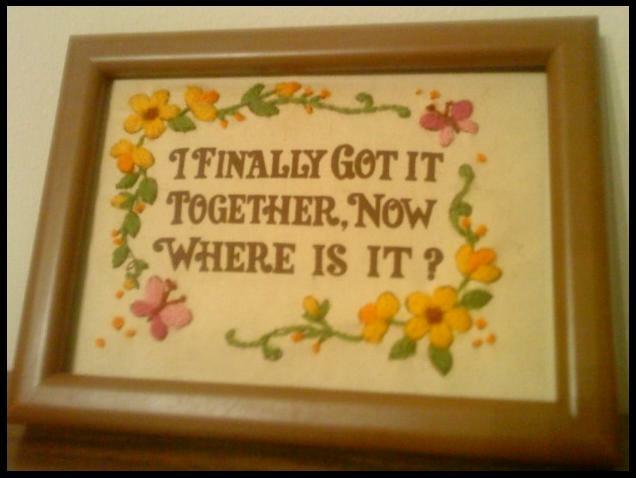 Thanks to the sharp eye of my bestie, I'm now the proud owner of this. How fab is that? From the tape on the back (and my god is there a disgusting amount of rotting tape on the back), you can tell it's vintage! Joining the party over at THE THRIFTY GROOVE for THRIFTY THINGS FRIDAY! 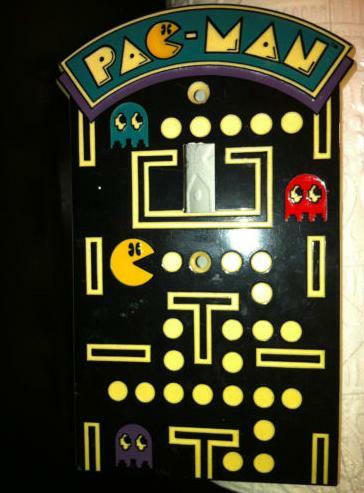 Nice retro Pac-Man light switch plate by Namco. eBay buy, couldn't resist. After winning I noticed that we don't have light switches to fit this. The boyfriend says he can change the switch, which I had no clue you could do, so I can't wait! Nice to have a handyman around the house. As you may or may not know, this past weekend I was was driving down to Windsor from Toronto. A 4 hour drive slowly turned into a 10 hour drive stopping at fast food restaurants, random winners & the occasional thrift shop. Now, I didn't find as much stuff as I had hoped, but I did find some amazing stuff nonetheless & better yet I found the most amazing shop - One of a Kind Antique Mall. The most gigantic antique mall I have ever been in with over 400 booths & 50 fricking thousand - 50,000 square foot of some reasonably priced & not so reasonably priced items. Some of the not so reasonably priced items that you may desire off eBay, etsy or elsewhere may still be a deal when you factor in the shipping costs. But this place is truly amazing. Quite a sight to see. We spent an hour in here. None of the items below are from the mall though, but these will come sometime this week. Windsor has an Antique Mall, not quite as big as the one in Woodstock, ON, but good enough. There I found this beautiful Reed and Barton bowl I most likely would have passed right on by if I hadn't been drooling over it on Atomic Betties a little while ago. One of my favourite finds of the trip! 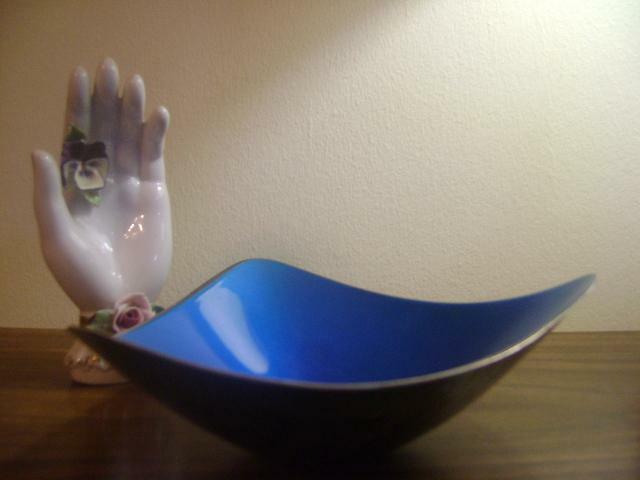 The Value Village in Windsor also yielded this porcelain hand. Not sure if I am done collecting those yet. My tastes might have moved on. Lastly for this post, I have to say my favourite find of the trip. This vintage "bowlers crying towel" might have come in handy had I lost our rock & bowl bowling game later than night. 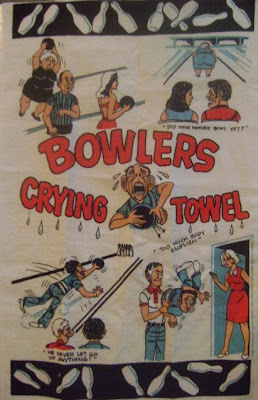 First game came in first, second game came in second & third game was such a mess everyone was bowling for everyone & scores were in the 40s & 60s. I guess rock, bowl & booze does that to you. The start of "Tour de Thrift Sourthern Ontario 2011" started yesterday in Mississauaga & yielded a few goodies. A highly envied Gooseberry #444. 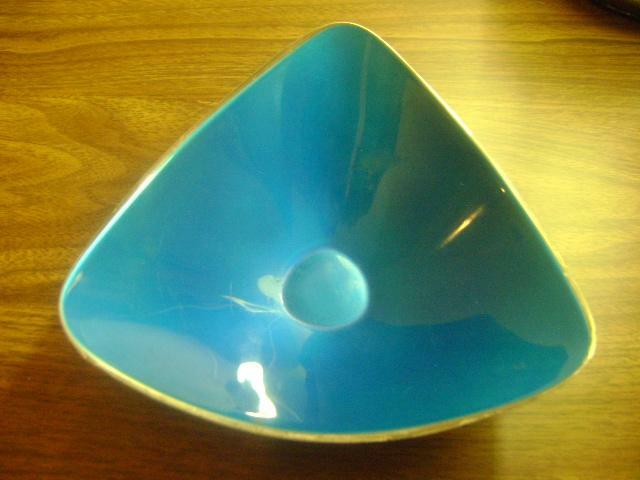 I've been passing this one in a vintage store, I love the colours of this one & they are charging $35 for the bowl (last time I checked!)! Not too condition. This sucker was just rolled out from the back, lucky I spotted it, we were just about to hightail it out of there. Another great Value Village deal - $3.99. Call me crazy, but I love how this pattern is raised. I love to rub my finger & nail over it. Sounds creepy, I know. A total savings of: $31.01! 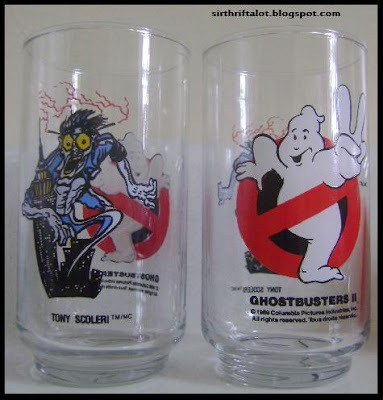 Onto Goodwill - a set of Tony Scoleri glasses. Great condition, a buck each! I'll check in with you this weekend! Crossing my fingers for some great thrift action! 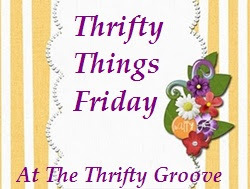 Joining in at THRIFTY THINGS FRIDAY over at THE THRIFTY GROOVE. One of my favourite patterns. Lucky enough to find these two, both at reasonable price in surprisingly good conditions at a local Value Village. They had been in the shop for 4 days. Both were sans lid & both were $1.99, which brings me to Value Village's perplexing Pyrex pricing patterns. I've seen something similar priced at $8.99 in terrible condition at another Value Village & on the same trip at this shop I bought a red fridgie for $2.49 with a deep scratch & some wear. I'm just happy I got a deal on two great pieces! I'm also in love with this vintage key chain. I usually check the key chain section with these key chains in mind. This is the first one I've found! Remember back in the days before hotels & motels had key cards? They had such lovely, interesting key chains. 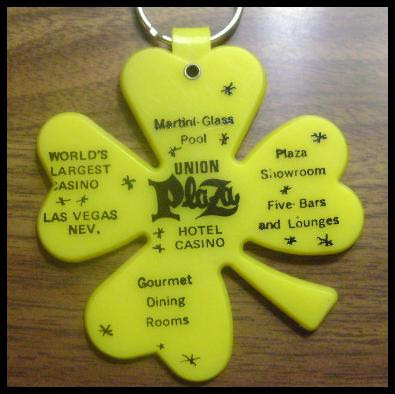 Probably not actually a hotel key chain, but just a souvenir, but I am actively searching for those old hotel key chains for some reason! This one for the Union Plaza Hotel Casino in Las Vegas, Nevada advertises "World's Largest Casino", "Martini-Glass", "Pool", "Five Bars & Lounges", "Gourmet Dining Rooms". 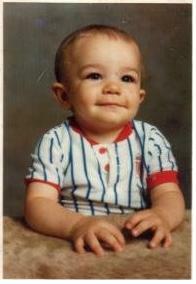 Yesterday, August 7th, was my 27th birthday. 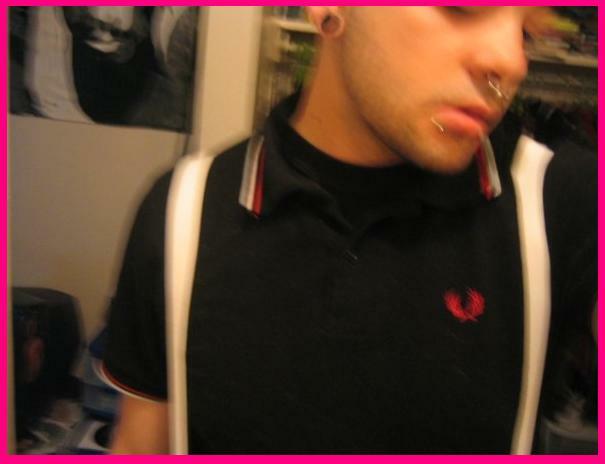 I've only posted one picture of myself on here. They are older. No new pictures will be posted on here until I lose some weight. "I really need to lose 3 pounds." - Regina George. Today was a small thrifting trip, but it yielded 2 OK finds. A nice CATS by NINA LYMAN plate. $2.02. 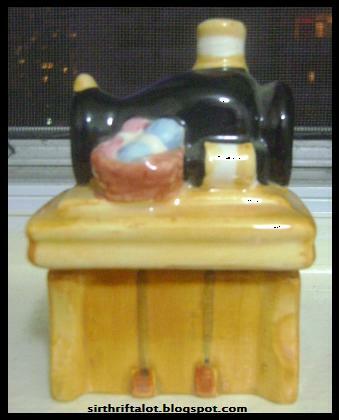 Also a set of red & yellow egg shaped salt & pepper shakers that were made in Japan. Also picked up $18 in reto sheets & pillow cases. Going to save those for tomorrow... going to bed now! Up at 5:45AM for work tomorrow. Next week on Friday I will be having a HUGE thrifting adventure with my boyfriend & my bestest friend in the whole word. We're going on a road trip to Windsor & making quite a few stops along the way. 10? 15? 22? 30? Time will tell.. We're going to have to pack lightly. Some of my favourite songs from the '90s..
Funky Retro Radio & Pyrex! pictured: IDK what it is, but I liked it & asked the woman if I could take a photo of it. $50 & she said she had it in every room of her house at some point except for her bathroom. I was finally blessed with a Sunday off so I treated myself & my boyfriend to the Sunday Antique Market here in Toronto! I've only been once before & left empty handed. 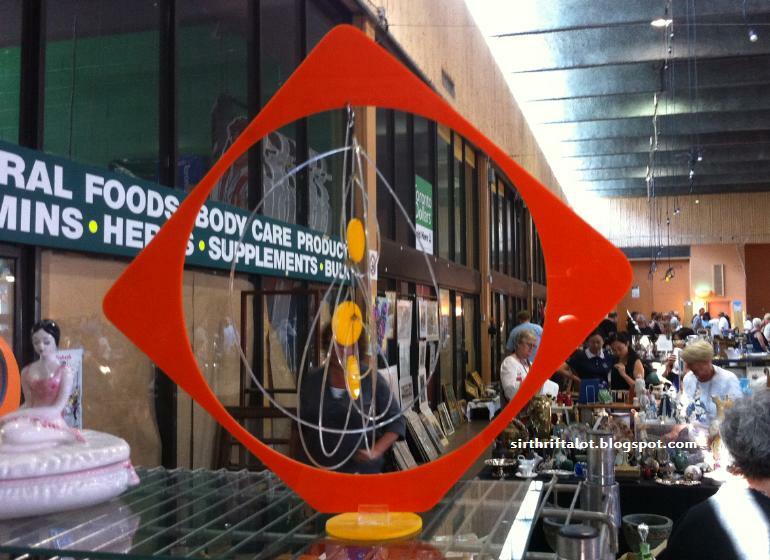 This is the closest you'll get to a flea market downtown. Open from dawn to 5PM (12 hours), you never now what you are going to find. 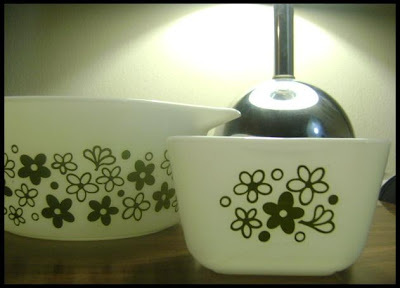 According to their website, you never know who is going to show up as well - Diane Keaton, Jamie Lee Curtis... Now there were no celebrity sightings this time & only a few Pyrex sightings, I did leave with 3 thrilling items for my collection. 2 new Pyrex fridgies! Awesome condition with lids. The seller was telling me he had all kinds earlier, but some woman had come & cleaned him out. Lucky Thrifter, was that you? Onto my favourite purchase of the day. I`m so thrilled about this one. It has to be one of my favourite of the year so far, probably wind up at my end of year top 10! Isn`t it cool? When the radio is on, or just when it`s plugged in, the yellow, green & red lights you see on the inside go on & off. It was like a little rave in out kitchen. There is no maker marking. The only thing I am able to tell is that the radio was made in China. Does anybody know anything about it? I prepare a little video of the radio - with the lights on & with the lights off. 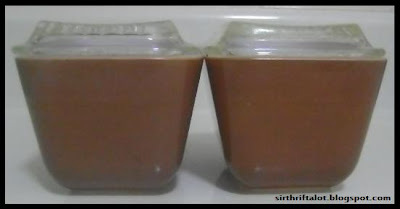 OK, WELL THE VIDEO KEEPS UPLOADING IN ERROR & I`M TIRED... SO, I WILL TRY TO FEATURE IT TOMORROW. ME: "$1450.. that`s a lot!" BF: "No it`s not, I`ll buy it for you." ME: "Babe, your don`t understand. It`s not $14.50, it`s $1450. 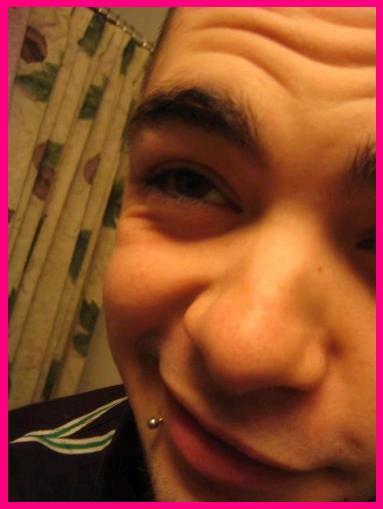 You`re too cute." 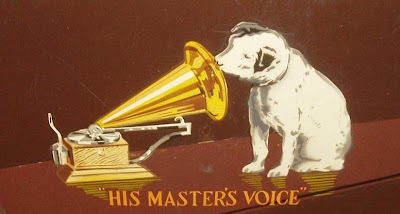 Too funny he thought that a vintage advertisement for RCA would be fifteen bucks.. haha.